Harding's undeviating Republicanism and vibrant speaking voice, plus his willingness to let the machine bosses set policies, led him far in Ohio politics. He served in the state Senate and as Lieutenant Governor, and unsuccessfully ran for Governor. He delivered the nominating address for President Taft at the 1912 Republican Convention. In 1914 he was elected to the Senate. Although the Republicans lost the presidential election in 1916, the dramatic speech by Harding led him to run for the office 4 years later. In 1920, a group of Senators, took control of the Republican Convention when the principal candidates became deadlocked. These Senators turned to Harding. 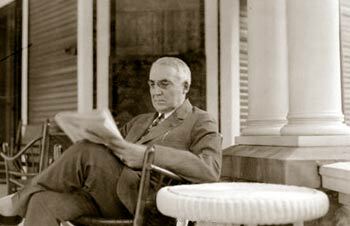 Harding's "front porch campaign" during the late summer and fall of 1920 captured the imagination of the country. Not only was it the first campaign to be heavily covered by the press and received widespread newsreel coverage, but it was also the first modern campaign to use the power of Hollywood and Broadway stars that traveled to Marion for photo opportunities with Harding and his wife. Al Jolson, Lillian Russell, Douglas Fairbanks, and Mary Pickford were among the conservative-minded luminaries to make the pilgrimage to central Ohio. Business icons Thomas Edison, Henry Ford, and Harvey Firestone also lent their endorsement to the campaign. From the onset of the campaign until the November election, over 600,000 people traveled to Marion to participate. He won the Presidential election by an unprecedented landslide of 60% of the popular vote. Newspapers hailed Harding as a wise statesman carrying out his campaign promise-- "Less government in business and more business in government." Word began to reach the President that some of his friends were using their official positions for their own enrichment. Alarmed, he complained, "My...friends...they're the ones that keep me walking the floors nights!" He did not live to find out how the public would react to the scandals of his administration. In August of 1923, he died in San Francisco of a heart attack. Under President Harding, seven American oil companies formed a consortium, led by Standard Oil of New Jersey to develop Iraq's oil reserves which began American investment in energy resources in the Middle East. Harding was also the first president to ride to his inauguration in an automobile on March 4, 1921. Harding was born in November, 1865, near Corsica, Ohio (now Blooming Grove, Ohio). Harding was the eldest of the eight children of Dr. George Tryon Harding, Sr. and Phoebe Elizabeth Harding. His birth name was Warren Gamaliel Bancroft Winnipeg Harding, but his mother called him "Winnie." Harding went Ohio Central College in Iberia, Ohio. While a college student, he learned more about the printing and newspaper trade, while working at the Union Register in Mount Gilead. After graduating, Harding moved to Marion, Ohio, where he raised $300 with a few friends to purchase the failing Marion Daily Star. Harding converted the paper's editorial platform to support the Republicans and enjoyed a moderate degree of success. However, his political stance was at odds with those controlling most of Marion's local politics. When Harding moved to unseat the Marion Independent as the official paper of daily record, his actions brought the wrath of Amos Hall Kling, one of Marion's wealthiest real estate speculators, down upon him. In July, 1891, Harding married Florence Kling, an older woman, a divorcee, and mother of a young son, Marshall Eugene DeWolfe. She had pursued him persistently, until he reluctantly surrendered and proposed. Florence's father, Amos Hall Kling, was Harding's nemesis. Upon hearing that his only daughter intended to marry Harding, Kling disowned her and even forbade his wife to attend her wedding. He opposed the marriage vigorously and would not speak to his daughter or son-in-law for 8 years. The restored house was built in 1891 and contains almost all original furnishings owned by President Harding and his wife Florence. The library was renovated in 2005. 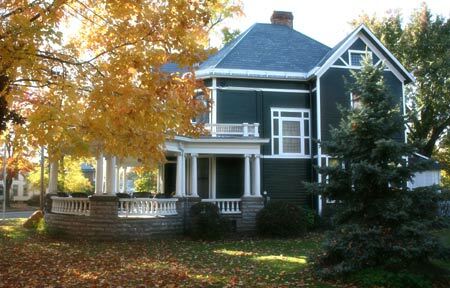 Adjacent to the Harding Home is a press house used during the 1920 campaign which now serves as a museum dedicated to President and Mrs. Harding's lives. It's a phrase we hear everyday referring to the founders of the United States. But it was Warren G. Harding who first used it in a speech to the Republican National Convention in 1916.